USP 797 applies to all "health care institutions, pharmacies, physician practice facilities and other facilities in which compounded sterile preparations are prepared, stored and dispensed." USP 797 is designed to ensure the sterility of drugs, an important safeguard for patient safety. 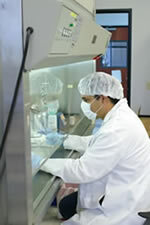 A critical aspect of USP 797 is environmental monitoring and microbial evaluation of sterile techniques in the preparation of compounded sterile preparations (CSPs). Forensic Analytical Laboratories, Inc. has worked closely with experts from the health industry to understand the analyses required to be UPS 797 compliant in microbial analysis. From analyzing air monitoring samples to glove samples, we have the knowledge and experience to assist health facilities to be USP 797 compliant. USP 797 requires viable air monitoring every six months in each area where compounding occurs. Sampling may also be required during any facility construction or equipment servicing. Compounding areas are sampled for the presence of both fungi and bacteria in the air. Analysis requires both enumeration and identification of any organisms isolated. Corrective actions are dependent on both the number of colonies and the identification of the microorganisms. Corrective actions must be taken immediately if the analysis identifies any highly pathogenic microorganisms. Personal glove sampling is designed to test the sterile practices of individuals involved in preparing compounded drugs. Prior to their preparing CSPs, all individuals must successfully complete (no cfu’s/hand) the glove fingertip/thumb sampling procedure three times (minimum). The sampling consists of gently pressing the fingertips onto a sterile media contact plate. Personnel who compound low- and medium-risk level CSPs must prove competent annually and those that compound high-risk CSPs must show competency every six months. Surface samples are intended to evaluate disinfected work surfaces for the presence of microorganisms. This is useful for evaluating facility and work surface cleaning and disinfecting procedures and employees. Sampling must take place on a regular schedule.